I’ve been putting off writing this entry, because I have so many emotions about the last couple of weeks, as do all of Amy’s family and friends. Still, I want to bring blog readers up to speed. First, let’s start with some good fundraising news: our Benefit for Breath on Saturday June 23rd raised $7590 for COTA in honor of Amy. The event turned out better than my or Janine’s wildest dreams. We actually extended the event by an entire hour, because it was going so well. A huge thanks goes out to the Wild Rover staff for making the event run so smoothly- and donating the space and the food. Of course another huge thanks goes out to our army of volunteers. Janine listed people specifically on Facebook, so I won’t take up space here, but you all know who you are. Bill, the owner of Wild Rover, remarked to me that he usually sees 1-2 people setting up for events like these, not the 10 (or 15?) that worked for hours before the event started (and of course the many others who put in time before the big day). Our first event went off without a hitch, and we are well on our way to meeting our fundraising goals. Speaking of which, our long term goal is to raise $65,000. If we raise $50,000 within our first 6 months (so on or about December 1st) COTA will give us a grant of $5,000. If we raise at least $25,000 they will grant us $2,500. Obviously our goal is 50K, because, ya know, money. Thanks to everyone’s hard work and donations we are well on our way! 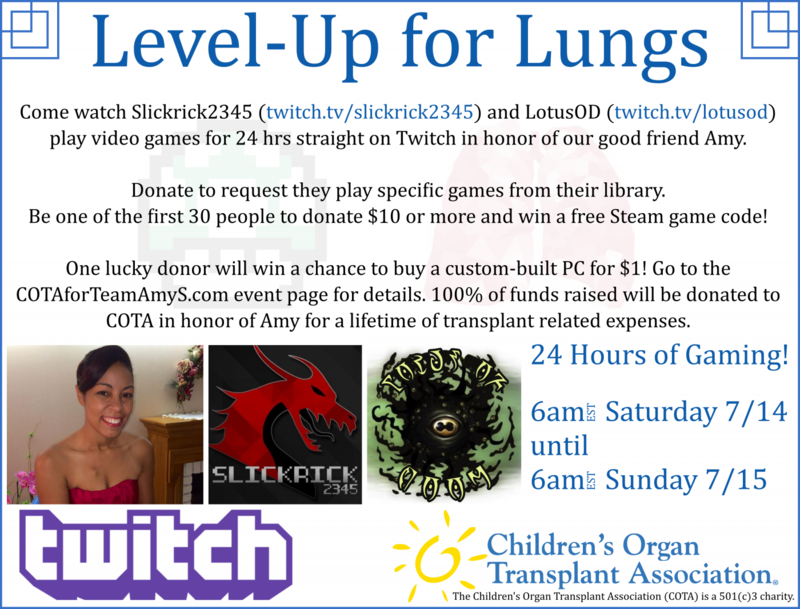 Level Up for Lungs- A 24-hour gaming event with twitch.tv happening Saturday July 14th 6am- Sunday July 15th 6am. Join users Lotus OD (twitch.tv/lotusod) and SlickRick2345 (twitch.tv/slickrick2345) as they play a multitude of video games that will be selected by YOU when you donate to our cause. Check out our Events page for more details. Flatbread Pizza in Somerville will be donating a portion of their profits to anyone who dines with us on Tuesday, July 31st. We’ll have another silent auction there too, with some amazing prizes. Most importantly, we have some updates on Amy. If you’ve been following our Facebook feed, you know it has been very touch-and-go from the start. On Father’s Day she finally received her new lungs! She was in the Cardiac ICU for almost 2 weeks before being transferred to the Respiratory Acute Care Unit at MGH. It has now been over 2-and-a-half weeks since her surgery and she still has a LONG way to go. She suffered so many complications before the surgery. It was almost like she couldn’t catch a break. By the end of May 2018, her lungs were rendered useless after a series of infections and a final bout with pneumonia. On May 28th, she was placed in a medically-induced coma and intubated to fight off infection. She was then put on an Extracorporeal Membrane Oxygenation machine, or ECMO, so her lungs no longer had to work and so she could be brought out of the coma. However, gaining consciousness proved to be too much, as her heart began to flat line due to hiccups in the ECMO machine. She was then placed in another medically-induced coma and a tracheotomy tube was inserted to make breathing a little easier while she waited for her new lungs. In short, her body was put through A LOT before her new lungs even arrived. Still, she is fighting SO hard. Since being transferred to the Respiratory ACU last week, Amy has become more and more lucid, as the heavy medications she was on begin to wear off. She’s been able to sit up and walk with the assistance of staff and several medical devices. On Monday, however, she suffered 3 grand mal seizures. As of the last few days though, our girl is TALKING in full sentences for the first time in over a month.On Wednesday, I was able to have a full conversation with her before they had to start one of her breathing treatments. And even though she’s still too weak to press buttons on the TV remote, her personality is beginning to shine through again. Typical Amy, the first thing she did when she saw me was ask me how MY life is going. Basically, this is where the support from COTA really kicks in for Amy and her family. The recovery process will take a minimum of 6 months and even up to a year. That’s one year of not being able to work, and needing round-the-clock care. Her loving sister, Sarah, quit her job and moved from Ohio to Boston to take care of her during this time. Her father, Jim, has to fly back and forth from Florida to look after her. Her mother, Maggie, has to make the hour-long drive to and from Haverhill when Amy needs her mom. There are meals, plane tickets, parking tickets, train rides, parking passes, co-pays, and many, many more things they will need to buy in order to be there for Amy when she needs it most. In order for the transplant to be successful she needs her family, and COTA is there for them. We’ve been so successful in raising money so far, but we still have a long way to go. Follow us on Facebook and Twitter @COTAforTeamAmyS for updates, donate when you can, re-tweet, share posts, and buy tickets. Because a few minutes of your time can mean a big difference to Amy and her family.